Red Cape Society Agent Clemeny Louvel is used to chasing werewolves across London. But when she’s reassigned to a special case just days before Christmas, she learns that she’ll need more than a silver bullet to keep everyone on the nice list. 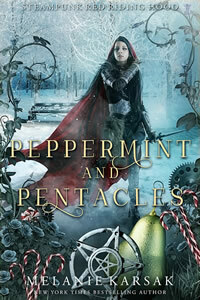 Peppermint and Pentacles is a retelling of the Little Red Riding Hood fairy tale set in Melanie Karsak’s bestselling steampunk universe. This Christmas-themed tale can be read as a standalone but is best enjoyed as book 3 in the Steampunk Red Riding Hood Series.